For other uses, see Bugle (disambiguation). "Bugler" redirects here. For other uses, see Bugler (disambiguation). Roman Bugle, 4th century. Added to the British Museum in 1904, this late Roman bugle is bent completely round upon itself to form a coil between the mouthpiece and the bell-end (the latter has been broken off). This relic was found at Mont Ventoux in France. The bugle developed from early musical or communication instruments made of animal horns, with the word "bugle" itself coming from "buculus", Latin for bullock (castrated bull). The earliest bugles were shaped in a coil – typically a double coil, but also a single or triple coil – similar to the modern horn, and were used to communicate during hunts and as announcing instruments for coaches (somewhat akin to today's automobile horn). Predecessors and relatives of the bugle included the post horn, the Pless horn (sometimes called the "Prince Pless horn"), and the bugle horn. The ancient Roman army used the buccina. The first verifiable formal use of a brass bugle as a military signal device was the Halbmondbläser, or half-moon bugle, used in Hanover in 1758. It was U-shaped (hence its name) and comfortably carried by a shoulder strap attached at the mouthpiece and bell. It first spread to England in 1764 where it was gradually accepted widely in foot regiments. 18th-century cavalry did not normally use a standard bugle, but rather an early trumpet that might be mistaken for a bugle today, as it lacked keys or valves, but had a more gradual taper and a smaller bell, producing a sound more easily audible at close range but with less carrying power over distance. The bugle is used mainly in the military and Boy Scouts, where the bugle call is used to indicate the daily routines of camp. Historically the bugle was used in the cavalry to relay instructions from officers to soldiers during battle. They were used to assemble the leaders and to give marching orders to the camps. The bugle is also used in Boy Scout troops and in the Boys' Brigade. The Rifles, an infantry regiment in the British Army, has retained the bugle for ceremonial and symbolic purposes. The cornet is sometimes erroneously considered to be the "valved version" of the bugle, although it was derived from the French cornet de poste (post horn) and the cor de chasse, itself another signalling instrument. 19th century variants based on the standard bugle included both keyed and valved bugles. Keyed bugles were invented in England in the early 19th century, with a patent for one design, the Royal Kent bugle, taken out by Joseph Halliday in 1811. This bugle was highly popular and widely in use until c. 1850 – for example, in works by Richard Willis, later bandmaster of the United States Military Academy Band at West Point. This variant of the bugle fell out of use with the invention of the valved cornet. 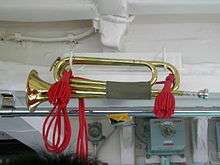 Modern instruments classified as bugles are often valved. ↑ "History of the Bugle Horn". www.army.mod.uk. Archived from the original on 5 October 2007. Retrieved 3 May 2008. ↑ "bugle - Definitions from Dictionary.com". dictionary.reference.com. Retrieved 3 May 2008.